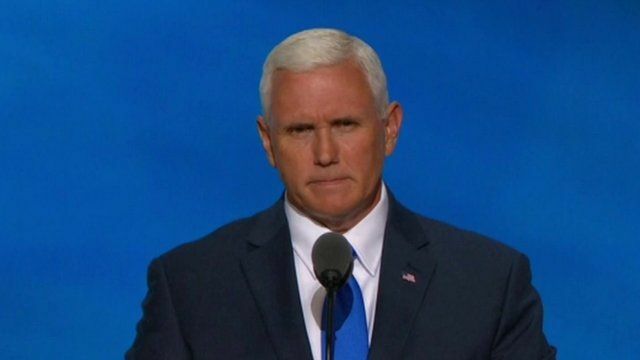 Pence: 'It's change versus status quo' Jump to media player Indiana Governor Mike Pence has taken to the stage at the Republican National Convention, confirming that he will be Donald Trump's running mate in the race for the White House. The moment the crowd turned on Ted Cruz Jump to media player Ted Cruz set off a firestorm when he didn't endorse Donald Trump for president during his speech at the Republican National Convention. Can Trump win with white voters only? Jump to media player Donald Trump might have officially clinched his party’s nomination - but winning the country over could hinge on one key factor - demographics. Did Trump speech copy Obama's? Jump to media player US election: Did Melania Trump copy Michelle Obama? Bernie Sanders endorses Hillary Clinton Jump to media player Presumptive Democratic presidential nominee Hillary Clinton gets the backing of her former rival. Indiana Governor Mike Pence has taken to the stage at the Republican National Convention, confirming that he will be Donald Trump's running mate in the race for the White House.